Since February 2005, over 135,000 visits have been logged to the TFA page and the petition has gathered over 16,000 verified signatures. (The actual count is closer to 20,000 but the petition site has had several backup failures where thousands of signatures were lost.) Over 13,000 votes have been cast for favorite song on album. I agree with all the reasons stated for releasing and revering the album, but my guess is that there must be something personal beyond what has ever been revealed about that tour and album that causes Neil to short shrift it. Must be something big given it's the only album left unrepresented on Decade- The Bridge at the very least was worthy of being included. I always thought it was just too painful because of Danny Whitten's 11th hour death preceding the tour. There is also the money disputes that went on, but I think we're grasping at straws, Neil has his reasons is all. The Detroit leg of the tour was the first concert I ever went to, and it was a great experience, especially the first half acoustic set. When the whole band appeared for the electric second half there was a discernible disconnect between band members, no interaction, very removed. It probably didn't help that they partook during intermission- I'm assuming. The only song that stands out in my mind is Don't Be Denied, and a very lethargic Alabama with Neil playing the Wing guitar. I also think that it is totally in the spirit of Archives to get an alternative version. In the meantime, we can only speculate so much. Hopefully if we ever see TFA II, Neil will fill us in a little more on the details, but only if it's not excruciatingly personal. "Time Fades Away. No songs from this album are included here. It was recorded on my biggest tour ever, 65 shows in 90 days. Money hassles among everyone concerned ruined this tour and record for me but I released it anyway so you folks could see what could happen if you lose it for a while. I was becoming more interested in an audio verite approach than satisfying the public demands for a repetition of Harvest. If Neil can do a "needle drop" recording of his favorite Mr. Soul version for the Archives, surely he could do the same for Time Fades Away. One could only hope that the songs from TFA, not already released on the Archives, get mixed from the multi-tracks and get presented on the Archives V2. The HDCD bootleg is incredibly easy to get, so until Neil decides to put it up for sale(he won't), that's my legal copy. The HDCD boot sounds pretty good to me. It could be released tomorrow. It should be. 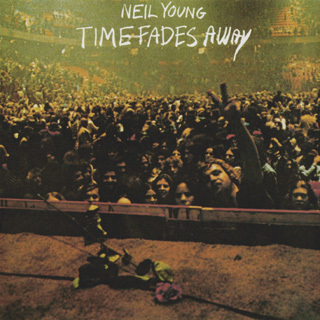 There is a lot to love on Time Fades Away, even if Neil doesn't think so. But it is his work, and his right to manage it as he sees fit. Since I have a download of that, I'm glad Archives 2 will have an "alternate" version. More new music! WHEN is Archives 2 expected? It should be a great collection, and I am getting impatient! Is this album valuable? I found a used copy at a local record shop for $10.00. Not that I would ever sell it, but I didn't realize it was that hard to obtain (legally). Glad to be part of the 5.6%! Yonder Stands the Sinner knocked me over the first time I heard it and still does. I always appreciate the'unorthadox' layouts Neil puts together, that one certainly shines for me. For me, "Yonder..........." ranks as Neils' worst song of the 1970's ! I love this album, so it's hard to pick a favorite, but I'd have to go with something from my “quiet triumvirate” (a term I just made up)- The Bridge, Love In Mind or Journey Trough The Past. The album is so hard driving, that by the time these three came along they always gave me a much needed chance to breathe a little. And they're so beautiful and poignant (“I will stay with you, if you’ll stay with me, said the fiddler to the drum”). But, if pressed I'd have to say The Bridge. On the contrary, and it's really uncomfortable for me to talk like this, but I'd have to put Yonder Stands The Sinner at or very near the bottom of all of Neil's songs for me. Yeah, it has its moments, but ah, no, it just doesn't work for me. But it's a small price to pay for an incredible album. BTW, it’s been mentioned here before, but I think it needs to be reiterated- can anyone think of another album or project that took such a risk in terms of its release following on the heels of a number one album? The uniqueness of a live album of previously unreleased material has already been mentioned too, and live albums are always a little rough, but unvarnished in all the ways TFA is? I mean, I'm sure Neil didn't set out with this decision in mind, but when push came to shove he took a huge risk in his determination to be honest about what had just happened. I can't think of a similar comparison. And if Neil's penchant for willfulness was ever in doubt up until this point, TFA marks the first unambiguous sign of what was to come, not to mention how clear a statement it made in staking out the claim that the art and the artist are more important than the audience, or at the very least are the more crucial determining point in the whole process. It's easy to say now how great an album this is, but when it first came out, trust me, the term great was not being thrown around by anyone. Really interesting stuff, surrounding a really interesting album- and on top of the whole mystery of Neil's stance toward it. I think that Elliot Mazer produced TFA, not David Briggs. Anyway, there's not original master for the Cd mastering.Or Neil gets the master from the acetate or other copies, as he has done other times for the Archives, or gets new mixes from the original multitracks reels, with a different sound from the original TFA. Love in Mind here is just an achingly beautiful thing. It's nice on Massey Hall, but this is the real thing. Ends so beautifully and too soon. And Don't Be Denied is a pure classic. Sinner? It is what it is but I like it. Passion. I would put a lot of 70s stuff below it. Without any thought - Vampire Blues. Motorcycle Mama. 1/3 of Stars and Bars. Yonder is a destination with no map, how'd he get there, how'd he get back. He ended up there out of pure emotional distress, to me anyway, and like a round of genufelcting to he old white porcelin throne, out it came in it's glorius polluted splender. Not necessarily a rosie endevour, but a catharsis of jettisoning a type of burden felt but not defined or understood. The passion is an accurate description. Few if any other songs he has done make me react like that one. DO you not love the ugly baby when he's yours? Passion. I'll have to listen to Yonder a few times from this perspective, and Neil did include it, so there must be something there. Wouldn't be the first time I missed a salient point. But it's all in the eye of the beholder, isn't it? I loved the seventies stuff, and to me Stars In Bars is a deceptively strong album, but I can see where people are coming from. I don't think they're wrong about any of it, they just didn't like it. Lucky Neil put it all out there tho, because there sure is a lot of grist for the mill, isn't there? Its part of what drives Neil I think, to put it out there and let it mean whatever it means to the next person who hears it. It becomes the ultimate fish tale, bearing little resemblance to what it started out being in the beginning. It all came out of Neil’s experience, and through the prism of his artistic and emotional lenses. I don’t think we're supposed to get what it means to him, or to the next guy. We're supposed to get what it means to us. Still, it’s fascinating to get a different take on things, it makes me think. Yonder clanked with me, but now I’m curious all over again. My trip with Young has been going on for just over 20 years now: effectively since I became aware of his existence, thanks to a friend whose music tastes back then were far better than mine. So Time Fades Away is just another of those things that fell through the cracks. But it's available, on vinyl, and that's a great way to listen to it. Looks like there's another one coming for your collection on RecordStoreDay 2012: The Mynah Birds - It's My Time b/w Go On and Cry. There are certain albums that can only be taken for a spin. "Time Fades Away" is one. Maybe it SHOULD only be taken for a spin, but its certainly possible for it to be your daily driver, at least til you break down, cuz the record won't be the one the let up. Buy a turntable... Neil sounds better on old vinyl anyway. There are many copies available on ebay and sometimes at your local record store.